Barack Obama is gunning for a confrontation with the Supreme Court, and Chief Justice John Roberts has signaled that he welcomes the fight. Last week, the chief justice described the president's State of the Union condemnation of the Citizens United decision as "very troubling" and complained that the speech had "degenerated to a political pep rally." Roberts was making an argument about etiquette--dissent was fine, he said, but Obama had somehow transgressed the boundaries of civilized discourse by delivering his attack to a captive audience. But he was implicitly making a political argument as well. 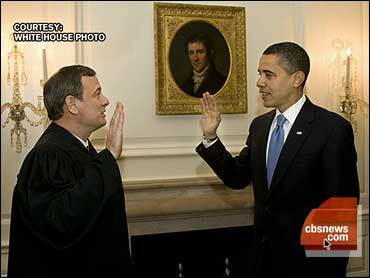 That is, Roberts seems to have joined the battle with Obama because he thinks the Court can win it. As a matter of history, this argument is wrong: In battles between a popular president and an anti-majoritarian Court, it's almost always the president who prevails. Using the Court as a punching bag puts Obama in the company of his greatest predecessors, Jefferson, Lincoln, and both Roosevelts--all of whom bashed the Court for thwarting the will of the people. As long as he plays his cards carefully, Obama has much to gain from challenging John Roberts, and the Roberts Court much to lose. The successful history of presidential Court-bashing shows how fragile the justices are in the face of presidential attacks supported by a mobilized majority of the country. Thomas Jefferson attacked his distant cousin and arch-rival, Chief Justice John Marshall, for his "twistifications" and suggested he couldn't be trusted; he encouraged Jeffersonian Republicans to intimidate Federalist judges by impeaching Justice Samuel Chase. Marshall reciprocated Jefferson's disdain, calling him "the great Lama of the Mountain." But Marshall was so spooked by the Chase impeachment that he anxiously suggested in a letter to Chase that Congress should be allowed to reverse Supreme Court decisions it considered "unsound." And he fell over himself to accommodate Chase's accusers when called to testify at the impeachment. Marshall had diffused the crisis, and Chase was acquitted. There was, however, no doubt that Jefferson had accomplished his mission: Marshall acknowledged that he never fought battles that he knew he couldn't win. Likewise, Abraham Lincoln vaulted from the House to the presidency by bashing the Dred Scott decision. "[I]f the policy of the government, upon vital questions, affecting the whole people, is to be irrevocably fixed by decisions of the Supreme Court the instant they are made … the people will have ceased to be their own rulers," Lincoln declared in his first inaugural address, as an agitated Chief Justice Roger Taney looked on, trembling with rage. Lincoln continued his attack on the Court in his first State of the Union message, where he proposed reorganizing the federal circuits, part of a broader effort to break the long-standing Southern majority on the Court. But Lincoln also wisely rejected extreme Republican proposals to pack the Court by expanding it from nine to 13 justices, or to abolish the Taney Court entirely, acknowledging that Supreme Court decisions should be binding when "fully settled" by the people of the United States. This isn't to say that Lincoln was a moderate on the question of the president's power over the Court: He flouted and denounced Chief Justice Taney's opinion challenging his suspension of habeas corpus. But Lincoln had an intuitive sense that Court-bashing can provoke political backlashes when it looks like an effort to coerce the justices into submission, and that presidential schemes to remake the Court can sometimes backfire when they're perceived to threaten judicial independence. As president, Theodore Roosevelt called the Court "a menace to the welfare of the nation," when it challenged his economic reform agenda. But, as a presidential candidate in 1912, he went beyond rhetorical fusillades and, in a progressive fury, proposed the popular recall of judicial decisions through referenda. He also argued for other state and federal laws that would allow voters to repudiate Supreme Court decisions that challenged the people's ability to be "the ultimate makers of their own Constitution." Only Colorado adopted proposals along these lines. And, of course, Roosevelt's Bull Moose candidacy went down to defeat. Franklin Roosevelt shows the perils and ultimate rewards of Court-bashing. He initially had public opinion on his side as the conservative Court began to strike down the New Deal in 1935. FDR fumed, "We have been relegated to the horse-and-buggy definition of interstate commerce." If the Court didn't retreat, he suggested, a constitutional amendment might be necessary. Elite editorial writers scolded the president, which may have emboldened the conservative justices to further activism. But Roosevelt won the election of 1936 in a landslide. After criticizing the Court in his 1937 State of the Union address, he proposed his notorious Court-packing plan, which raised concerns about executive dictatorship. But, although his Court-packing plan failed in the Senate, it may have cowed the Court into upholding the New Deal. Legal historians, such as Barry Friedman of New York University, persuasively contend that, if the swing justice on the Hughes Court, Owen Roberts, hadn't changed his mind about the New Deal, Roosevelt would have prevailed in mobilizing public support for disciplining the justices. All this suggests that Obama should have no hesitation about vigorously criticizing the Citizens United decision--and any future rulings by the Roberts Court striking down his reform agenda, such as challenges to health care mandates or financial regulations. As for the chief justice, the more that he is moved to respond openly to Obama, the weaker he will appear. Even the Court's most savvy politicians--like Charles Evans Hughes, the former governor of New York and the chief justice who presided over the Court during the New Deal era--haven't been able to outmaneuver their presidential adversaries. Although Hughes managed deftly to defuse FDR's Court-bashing campaign, he only accomplished this feat by capitulating to the president's agenda, writing key decisions that upheld New Deal programs. The greatest appeal of Court-bashing for Obama is that it can be based on a principled vision of economic populism and judicial restraint. Obama's guide here should be Louis Brandeis, who would have been appalled by the Citizens United decision. Brandeis denounced the "curse of bigness" that allowed huge corporations to take reckless risks with "other people's money" and then avoid accountability for their role in provoking economic crises. Brandeis also would have rejected the Roberts Court's vision of the free-speech rights of corporations: In his view, the purpose of the First Amendment was to make men and women free through reasoned deliberations, liberating them from huge corporations that were too large to be run on a human scale. By embracing a Brandeisian vision, Obama could gain all the benefits of Court-bashing while avoiding all of the dangers, arguing plausibly that conservatives have betrayed their long-standing principles by using narrow Court majorities to reverse their defeats in the political arena. In this kind of fight, the Roberts Court doesn't stand a chance.